Most people in Britain are getting poorer. For obvious reasons, the government and supporters of austerity would prefer not to discuss this fact. Yet in the strained language of the Labour right, there has also been a clamour for Ed Miliband to ‘change the narrative’ on the economy by no longer talking about the cost of living crisis. This is based on the completely false notion that that the economic recovery under way will inevitably produce higher living standards. This fails to understand the content and purpose of current economic policy. It is also based on a refusal to face facts. Some of the key facts on the cost of living crisis are glaringly obvious. The chart below shows the change in regular average pay as well as the change in total pay including bonuses. Also included is the change in consumer price inflation. 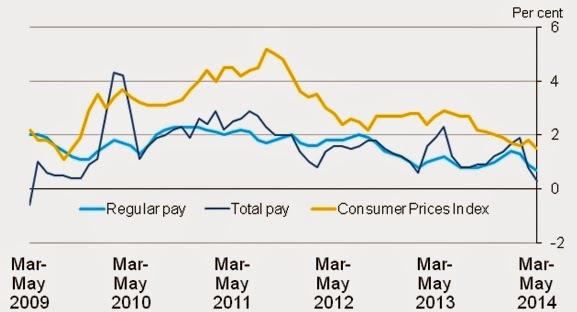 Under four years of the Tory-led Coalition, regular pay has fallen by 5.25%. This real decline in pay is understated in two ways. The first is that the CPI is a narrow measure of prices. In particular it excludes housing costs. Broader measures of inflation have tended to be higher over the last four years. In addition, only the pay of employees is captured by these average wage data. Anyone forced to work in self-employment, casual or other work without a regualr wage is not included in the data. These categories, along with part-time workers, have formed the bulk of the jobs growth over the last period, which has been a key factor in depressing wages generally. A broader, more accuarate picture of average wages would show a picture that is much worse. It also seems as if the fall in living standards on this measure is unprecedented. 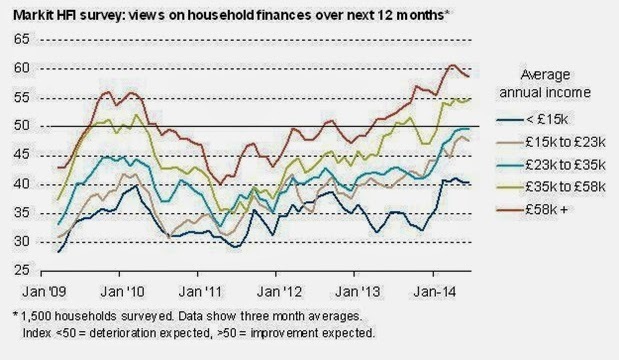 The chart below is via Ed Conway, economics editor of Sky TV, who regularly provides very useful economic data. It shows the cumulative fall in real wages over a 5-year period. This shows real wages contracting by 7.6% over that time period. Real wages have not fallen so sharply since records began in 1864, not even in the Great Depression of the 1930s. As we have already seen, there is also no end in sight. Wages continue to fall behind inflation. This is the key fact which underpins the ongoing cost of living crisis. But it is not confined to the issue of wages. Of a total British population of 64 million on latest estimates, only 30.6 million are in work. The rest, the majority of the population, are mainly comprised of young people, the elderly, the unemployed and economically inactive. They too have tended to experience a fall in living standards as social security entitlements and public services have been cut. They are often at the sharpest end of the cost of living crisis. An obvious question arises, if the economy is recovering in real terms how is it that real wages have fallen so sharply? The answer is twofold. First, the population is growing, so that GDP per capita remains significantly below its 2008 level, before the recession. But the content of austerity is to transfer incomes from labour and the poor (such as wages, or the benefits of social security as well as public spending) to capital and the rich (in the form of profits, tax breaks, tax cuts, privatisations, and so on). The aim is not to lead to stagnation, which is a consequence of the investment strike by firms. The aim of austerity policy is to boost the returns to capital. Under conditions of stagnation, this can only be achieved by reducing wages and the transfer payments to workers and the poor. This can be seen directly even in the form of incomes and prosperity. The chart below is via Chris Williamson, chief economic at economic survey and analysis firm Markit. It shows expectations of household finances over the next 12 months by income bracket. In effect, the higher income households tend to be more optimistic on average about their living standards, while the poorer are more pessimistic. The poor are getting poorer. Among the rich, the lion’s share of the recovery is claimed by the ultra-wealthy, the owners of capital, landlords and so on. The Tory Party sees no reason to change these trends of the economic policy that led to them. They would carry out more of the same, renewing the austerity offensive that has been soft-pedalled ever since the poll ratings plummeted in 2012. Labour is currently debating economic policy. Evidently, it would be wholly counterproductive to abandon the focus on the cost of living crisis now, which is already the deepest on record and is continuing. Yet the scale of this crisis also means that any policy is appropriate to the magnitude of the crisis. SEB has previously outlined some of the measures that could be taken. All proposals and policies need to be assessed in light of the extremely grave economic crisis that Labour will inherit in 2015. The world’s largest companies are hoarding cash and cutting productive investment at the same time. The Financial Times reports a survey from one leading ratings’ agency, Standard & Poor’s, which shows that the 2,000 largest private firms globally are sitting on a cash mountain of $4.5 trillion, which is approximately double the size of Britain’s annual GDP. 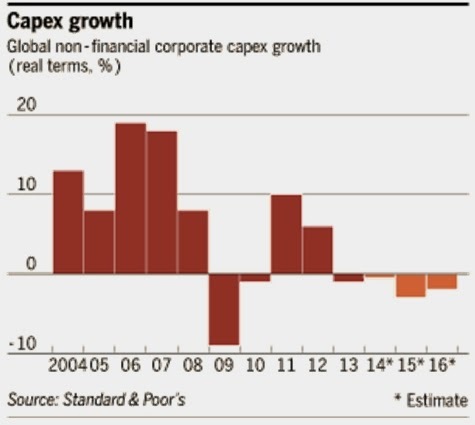 Yet capital expenditure, or ‘capex’ by those firms fell by 1% in 2013 and is projected to fall by 0.5% this year. But this does not presage an upturn. Steeper declines in productive investment are projected by those firms in both 2015 and 2016. Taken together, if these projections materialise the actual and projected falls in capex over the 4 years from 2013 to 2016 will approach the calamitous fall in productive investment seen at the depth of the recession in 2009. This is shown in the FT’s chart below. SEB has previously argued that companies are not prevented from investing by lack of access to capital or similar factors. They are sitting on a cash mountain. The same is true of British firms. There is plenty of money left, but firms refuse to invest it. This is because private firms are not concerned with growth, either GDP growth or the growth of their own productive capacity. They are primarily driven by the growth of their own profits, or preserving them. Where that is not possible, where new capex will not meet an expected level of return, no new investments will be made. The survey findings are reinforced by recent research from investment bank Morgan Stanly, which focused on the US economy. It argued that there were two reasons to expect little improvement in productive investment. One is that the US economy is far below using all the existing manufacturing capacity currently available, so has little need to add new fixed capital. The second reason is that shareholders tend to oppose heavy commitments to new, large-scale investment. Managements that do not invest are rewarded by shareholders, while those that do are punished (lower share ratings, lower financial rewards for managers and ultimately, loss of job if the investment turns sour). Contrary to mainstream economics, this indicates that the interests of shareholders are not ultimately aligned with those of society as a whole. Instead the interests of shareholders frequently stand opposed to an increase in productive investment, which is the key mechanism for raising productivity and living standards. Or, as another investment bank shows, the greater the long-run returns to shareholders, the lower the growth rate of GDP, and vice versa. The chart below is from CSFB and has previously been used by SEB. It shows the relationship between average shareholder returns and average GDP growth over a number of countries from 1900 to 2013. 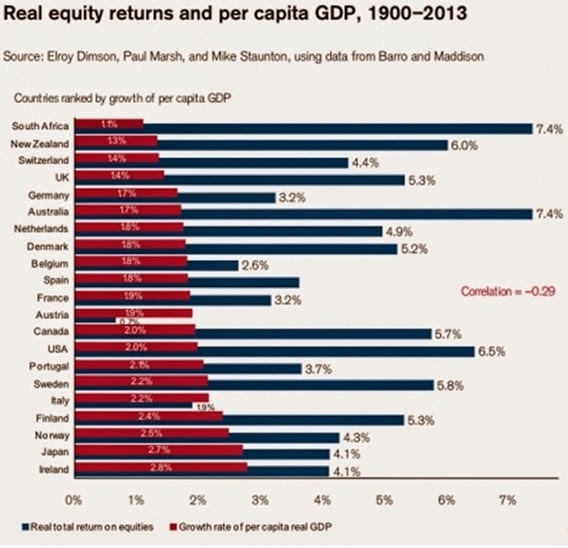 GDP growth is strongest where the returns to shareholders are lowest, and vice versa. This has clear and direct implications for economic policy. The Tory-led government has attempted to encourage private sector investment with a series of inducements, bribes, subsidies, privatisations and so on. But it has not worked. In the latest GDP data for the 1st quarter of 2014, business investment in the British economy remains £25bn below its previous peak level in the 1st quarter of 2008, even though GDP as a whole is £10bn below its previous peak. Total investment, which includes the government and the household sectors is now £49bn below its previous peak. The fall in investment accounts for the stagnation of the British economy and the main investment deficit originates in the business sector. 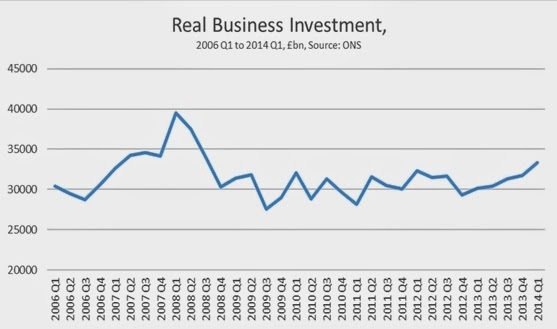 The trend in business investment is shown in the chart below. A continuation of the same policy is unlikely to yield different results. Instead a radical, reforming Labour government could direct investment itself, using the available resources. Even the current government has recently ‘fined’ Network Rail for to failing to meet its targets and will use the proceeds to upgrade wifi on the rail network, that is to engage in productive investment on a very small scale. The same logic on a vastly greater scale could be applied to the problems of declining energy capacity and the need to de-carbonise the economy. Fines running into billions could be legally applied to the privatised energy companies if they fail to meet new legislative targets on investment in renewables and energy efficiency. The proceeds can then be used for direct state investment. These and other methods could be applied to a series of key sectors, banking, energy, transport, health, education, infrastructure and so on. If the private companies still refuse to invest, government can use the fines to invest directly itself. In fact there are any number of methods of achieving the same objective. But, as the surveys and analysis from the financial sector show, the private sector currently has no intention of leading an investment recovery as profits have not yet recovered. So the state must lead an investment recovery.